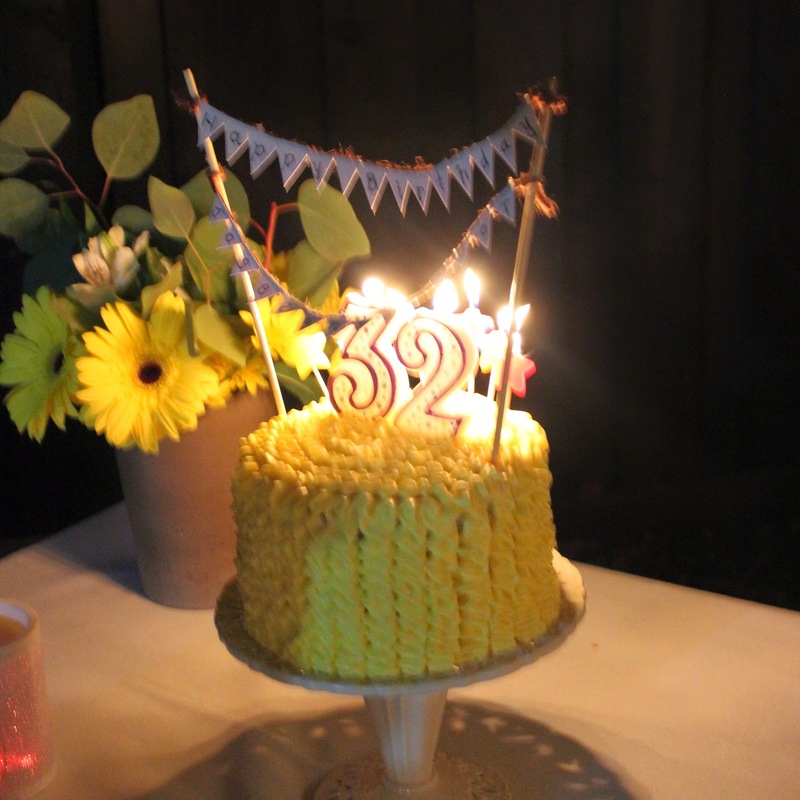 This weekend was another cake filled weekend. My sister and brother-in-law(my other sister's husband) share the same birthday, and they both turn the same age! (and they went to the same high school coincidentally!) They really are birthday twins! 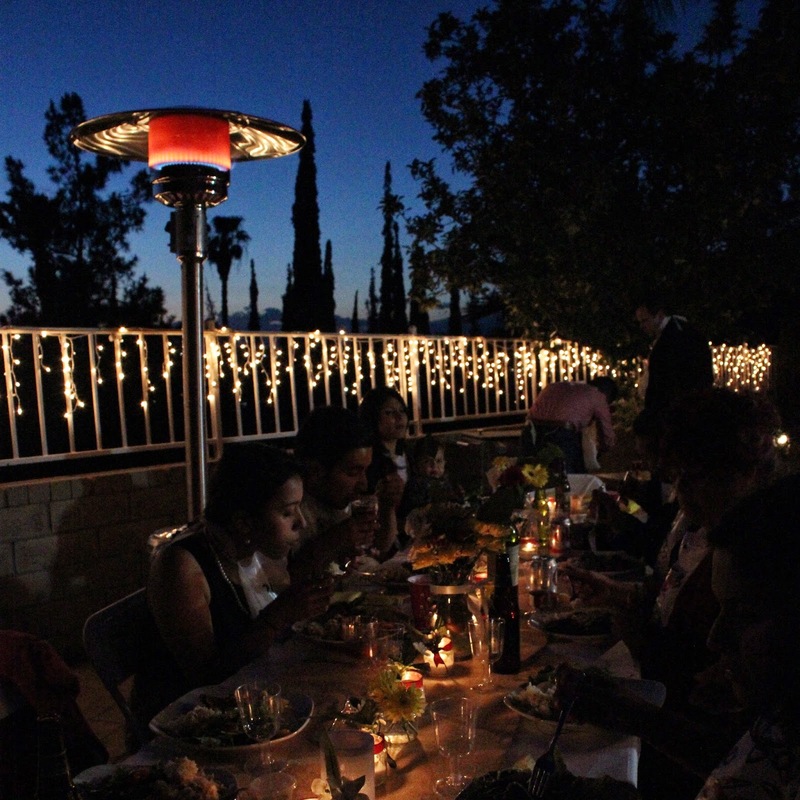 Anyhow, we had a nice birthday dinner at my sister's house and it was so pretty! And I, of course, made the cake! Here's the cake I made! Yellow, and ruffled! And here's a iphone pic of the table. So bright and spring like! 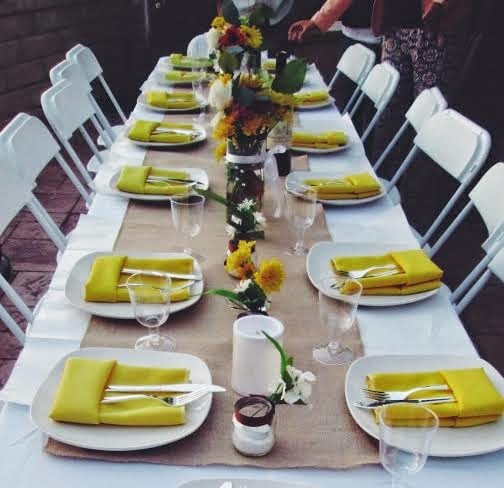 And our outdoor dinner! It was so fun, and perfect! And finally when we sang happy birthday at 11pm! That's how fun our evening was! And then this weekend, I also made a SpongeBob cake. It was really a fun cake to make! 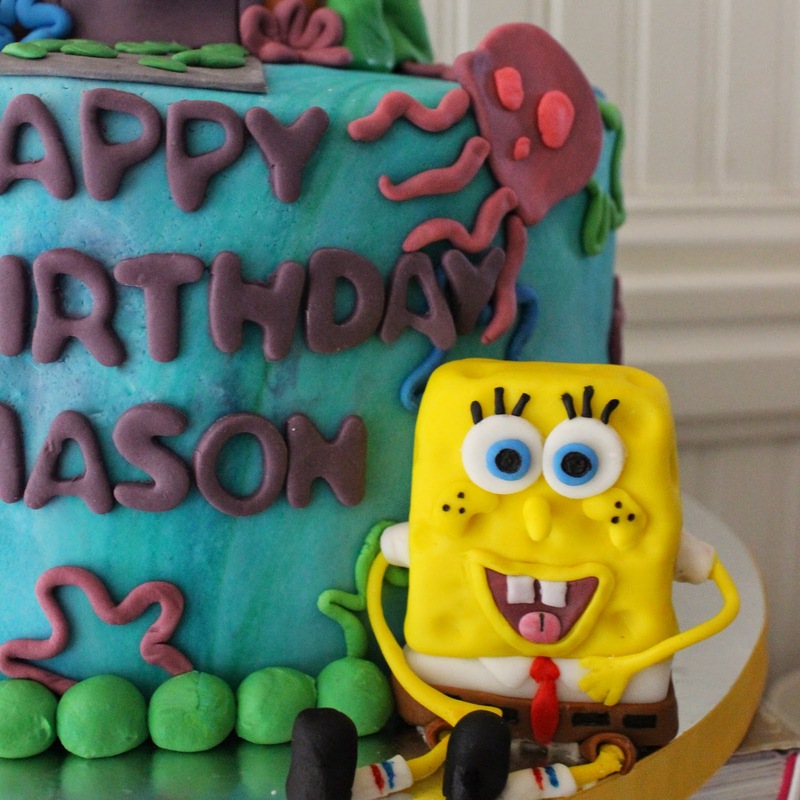 Surprisingly, I have never made a SpongeBob cake, so I had to do some cartoon research. I usually do this with kid themed cakes because I like to do small details on the theme on the cakes! Here's the whole cake! It was so bright, colorful, and I really enjoyed being creative with it. This isn't an original design, but I did add some of my own touches. This fondant SpongeBob came out a lot better than I hoped! 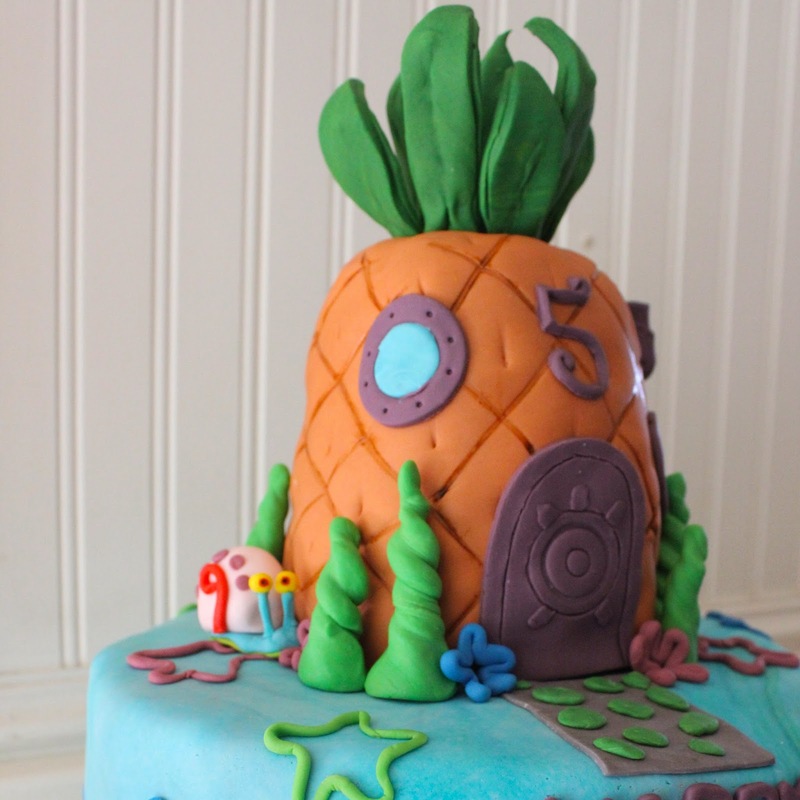 And finally, here's the pineapple house. Probably my favorite part! And I also added Gary peeking out of the corner. Love doing small details like that! And that's a wrap up of my weekend! Lately, my hubs and I have been toying with the idea of taking a trip, but we have been wanting something more by the beach, and this time we would go in the summer. While I have been searching airfares, I also have been looking at clothes! 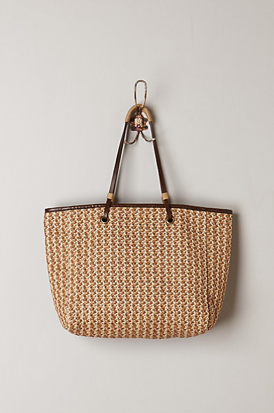 Anthropologie has the best fresh, and easy things for a trip that I have in mind! I want everything here! I think all these items will be on my wish list, especially that skirt! When I want to make something, whether it's a DIY project at home or a new recipe, I kind get obsessed until I can make it happen! I want to do it NOW. haha! So I got this idea of making popsicles and I of course went to go get a mold immediately! I searched places, and I didn't want to spend too much and the best mold on a budget is from Ikea, so I went and bought me a couple. I have been toying with flavors, and one of my ideas I haven't done yet because I still need all the ingredients, but I will be sharing soon, so stay tuned! 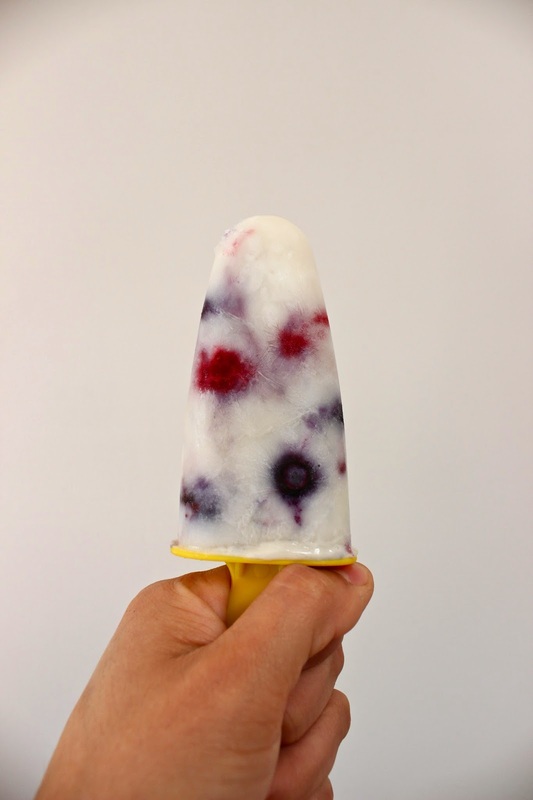 But I made some easy popsicles with ingredients I already had at home. And it's only 5 ingredients! Then I simply mixed 2 cups of coconut milk, 1/4 cup of agave sweetener, and a teaspoon of vanilla extract in a separate bowl and then poured into the molds. I put the tops back on, and put it inside the freezer for 3 hours(or until completely frozen) I was able to make 10 popsicles. 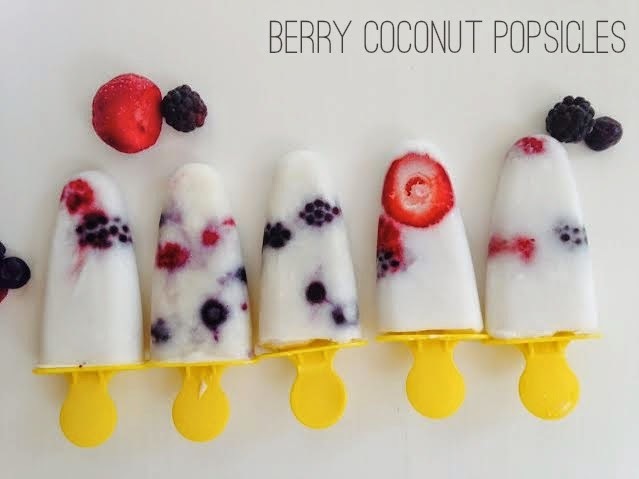 It seriously took me 5 minutes to make the popsicles! It's such an easy project, and so very refreshing! Not too sweet, and so berry yummy! The possibilities are endless with flavors! Now, on to my next popsicle project! This weekend we kind of did a semi big project we have been meaning to do. 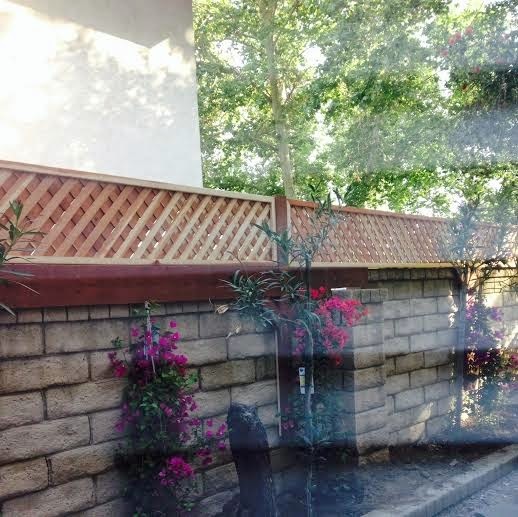 We built a privacy fence for a side of our house. We have been meaning to do this since we moved in. We only have one neighbor, and the side that faces towards my neighbor's house is where my kitchen and dining room face. I actually didn;t mind it because we have a wall in between, but the wall is not so high. They have a pathway to the backyard on the side that I face, so everytime someone went through it, I can see them. So when I'm cooking, or enjoying a dinner, I didn't want to feel like someone can see me or vice versa. 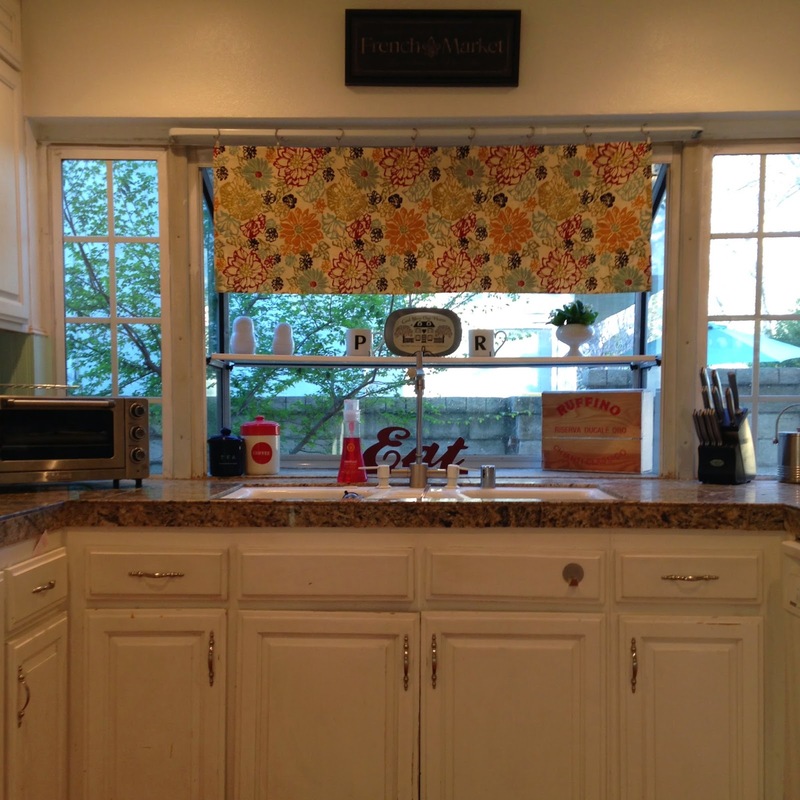 Oh, and the kitchen kind of faced one of their windows too, and their backyard. So if I was washing dishes, I could see whether they were swimming in their pool. The wall was just not high enough. The one thing that gave us privacy was that tree to the right, except we had to cut it since it was right next to the house and we didn't want foundation issues. You can kind of see the neighbors window, and their patio umbrella. Not my favorite view. And since we had never given too much attention to this area, and was a bit neglected, we decided to finally tend to it with a wooden lattice top fence. We hired someone, and they did it in a day! What a difference it makes! This is what I see now from my kitchen garden window. WOO! And this is what we see from our dining room. Oh, and we planted those trees prior, but those colorful shrubs we planted this weekend. We are looking to grow plants along the wall to give that side area more a brighter, and greener vibe. Will be sharing some other things we are planning to do to this side of the house. More ivy, and maybe planter wall boxes! But oh, what a wall can do! It's Good Friday, and I'm feeling good! I love Easter time. I know how blessed I am, but during this time I am just reminded how much! The perfect scripture for this time. And what a beautiful print! I just love it! 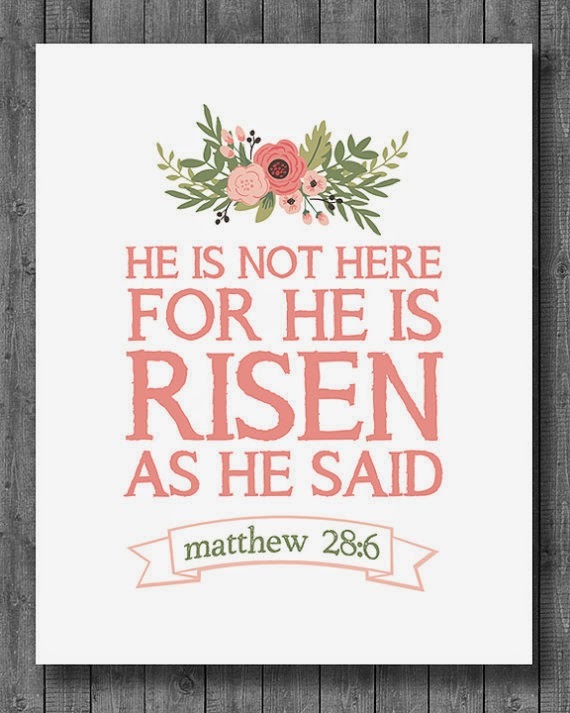 Have a great weekend with loved ones, and have a blessed Easter! I have been a fan of Mad Men since it first aired, and one thing I love about the show is their fashion! Who doesn't love it?? But every season, the fashion is slightly changing with time. Now in season 7, we are in 1969! 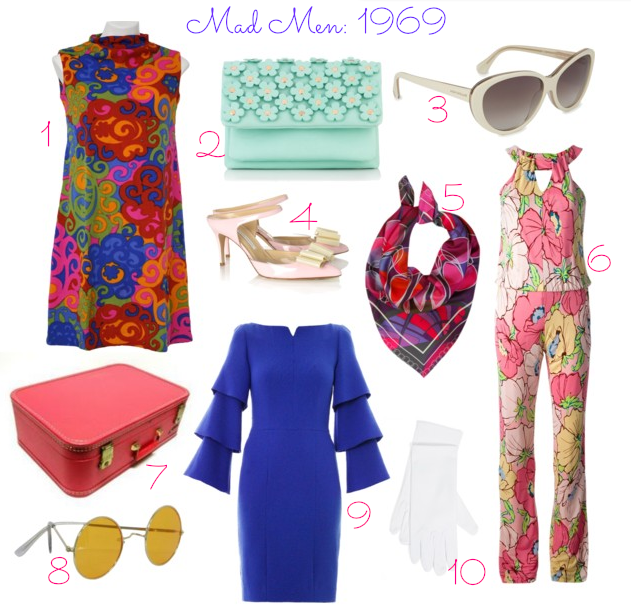 It's still a tad sixties, but you can definitely see the 70's fashion pushing through! 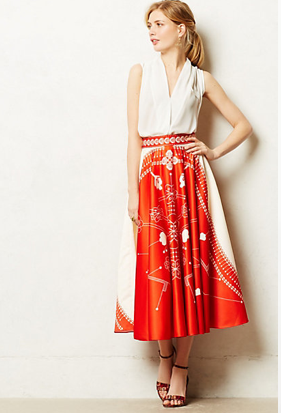 The dresses are shorter, the sleeves are bigger, and the patterns are more bold. As much as I miss the early sixties, the transition is fun to see, and I must admit, I'm kind loving the new fashion! 1. Megan Draper type of dress! 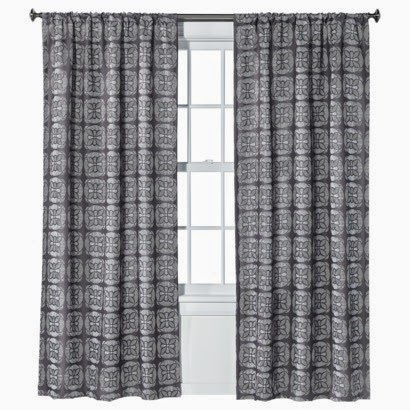 Very trendy, bold pattern, and mini! I can see Megan in this little number. 2. Daisies!! You need something with Daisies especially going into the '70's! Want this pretty little purse! 3. Cat Eye glasses are a stable for any classy fun gal! And those white frames, get me a pair! 4. 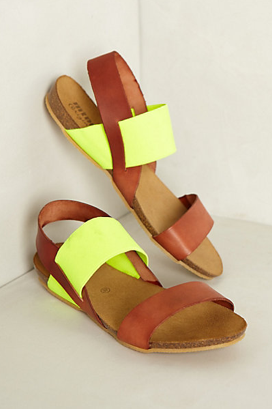 These shoes are darling! I can very much see hardworking Peggy in these! 5. C'mon, we need scarfs! Scarf have always been on trend, but now in the late sixties, it's been worn in more ways than one! 6. When Don was in California, I noticed the one piece jumpsuit making a break through. Very 1969 California! 7. With women in the workplace, they definitely need a bold luggage to travel in style! 8. These glasses for the the hippies, of course! Very cool, and makes any outfit look laid back. 9. This dress is very Joan to me. I can see her still sticking to her fitted dresses, but still in trend with the big bell sleeves! 10. White gloves scream Betty Draper . Although the times may be changing, Betty sticks to classic looks, and can rock those those gloves in 1969! Today, I'm totally inspired to wear some seventies inspired clothes! I love it! Can't wait to keep watching the last season of Mad Men! This weekend was filled with cakes and cupcakes! We celebrated my goddaughter's 8th birthday. She had a very pretty tea party, and the Queen even made an appearance! But of course, I made the cake for her! My best friend sent me ideas from pinterest, and I then went and did my own design. Here is her cake! 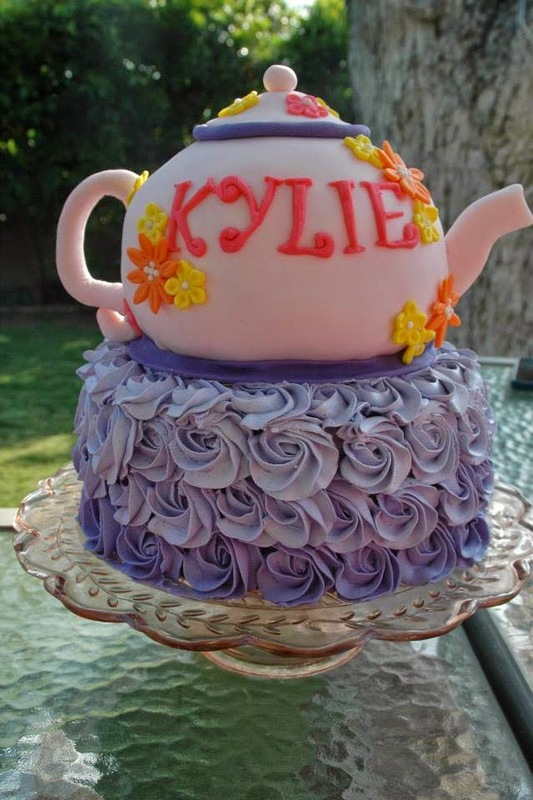 I made a purple rose ombre cake, and right above I made a tea pot cake with fondant. The teapot was easier than I thought. I have a round cake pan, and carved it shorter. And added fun bright flowers to tie in to the bright girly party! And the following day, we had a family get together to celebrate my nephews birthdays! Today is actually my nephew's 4th birthday, but his big brother's 6th birthday was a few weeks ago so I made both their cupcakes the same. (P.S. I only got a shot of my 6 year old nephew's cupcakes because the 4 year old went in to the fridge and decided to do some taste testing! Haha!) Both my nephew's love Ninja Turtles, so it seemed fitting to do fun cupcakes for them with that theme. Also, I loved Ninja Turtles as a kid so it was extra fun to make! My kitchen is now recovering from all the baking and cake decorating!! But I always have a great time making fun creative cakes! Must remember the yummy outcome when I see my messy kitchen! Haha! Did you guys have a good weekend? I sure did! It was busy, and my house is a mess! And the windows are done. 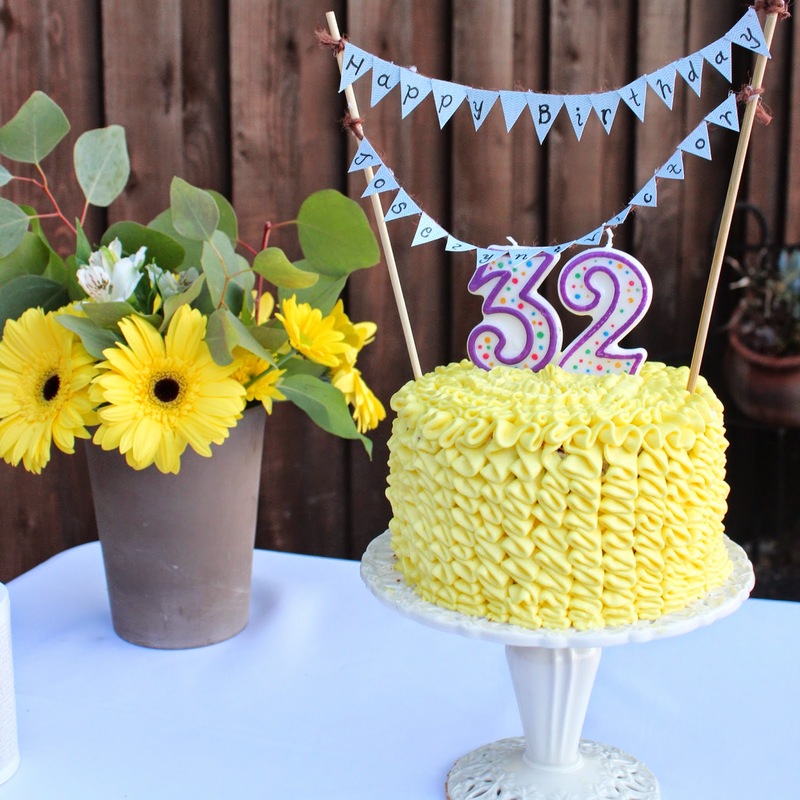 Oh, and I made a cake and cupcakes this weekend! But I will share those pictures tomorrow! I gotta get a hold on my house today! 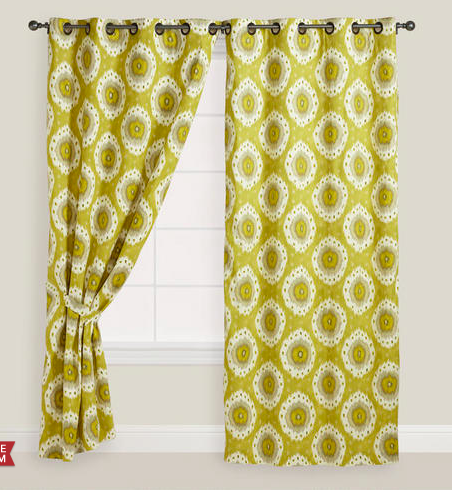 Anyway, I wanted to share some of the house curtains I'm loving. I'm currently looking for some for the back patio doors! Here are some of my favorite! 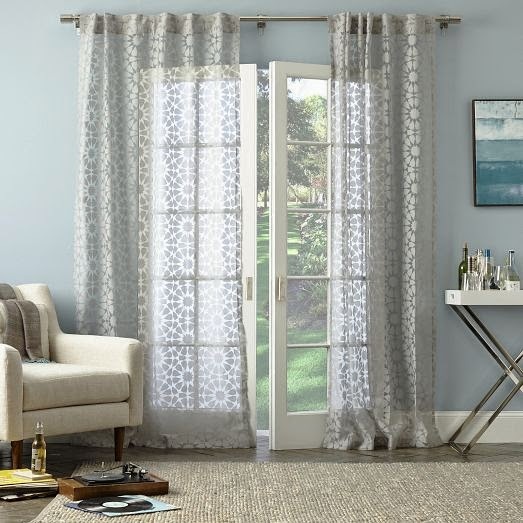 Love these from West Elm. I love that they still give a lot of light. I am digging these floral patterns from Target. 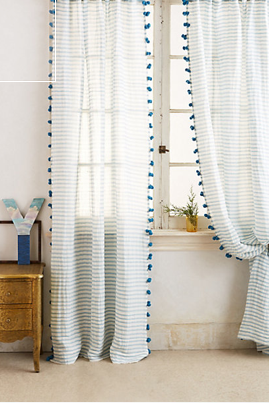 I love this anthropologie curtain. So fresh, and fun! And these bright yellow ones from World Market are so tempting too. Love the shade of yellow! Now, to decide. Wish me luck! I'm currently listening to the wonderful noise of drilling all around my windows. It's quite awful. It's loud and I'm sure my neighbors are hating on me. But the reason why? We got new double pane windows installed, and now they are adding the stucco and such. I didn't realize how big of a job this window job would be. I knew they would have to drill into my walls, but for some reason I didn't really think about it, until 10 workers showed up to my house Monday morning and all this noise was going on! Anyhow, we live behind a busier smaller street so we wanted to get rid of some traffic noise. Also, we had a back sliding door that didn't really work nor slide, and wasn't too secure. 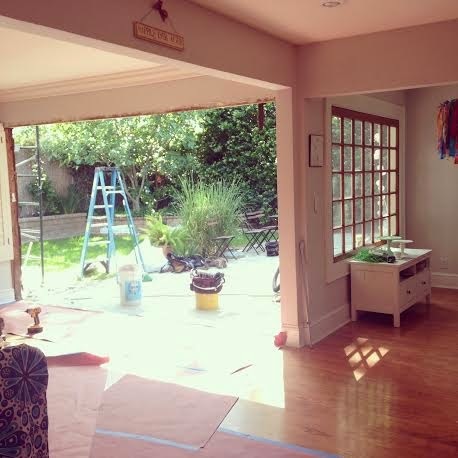 But they got rid of the window, I didn't realize how much my room transformed! It changed it completely! I will share the pictures of it after once I don't have a mess and workers in the background, but here are some before pictures! Here are our old doors! The screen didn't work either, and the natural wood didn't bother me too much, but now we got white doors are it made the space bigger! Here's my instagram pic of the giant opening without any doors. It was crazy to see such a huge opening. I never notice how big the space was! I will share my new windows with you guys next week! Very excited, but boy, just when I thought we done with big jobs for a while! I know those places are usually a hit or miss, but I usually find great skirts, dresses, and fun shirts there. 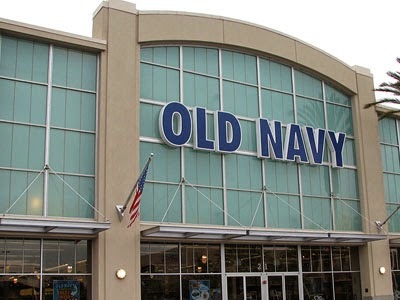 Not always, but it's my place to check out and I almost always leave with an item. 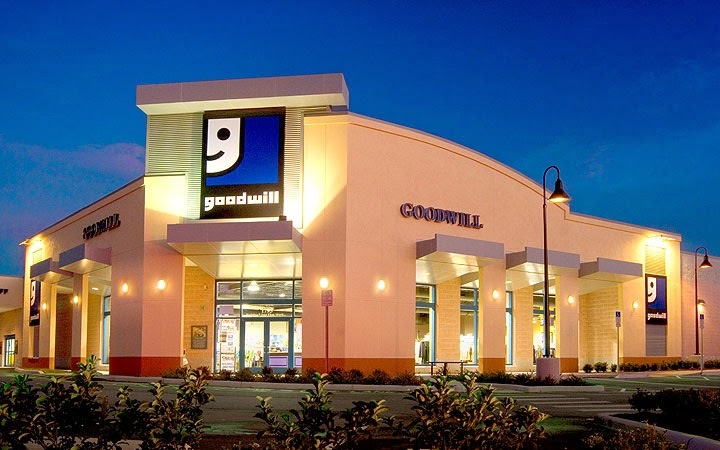 I'm usually at my local Goodwill checking what's new. I'm not sure if these places are considered "thrift stores" but they kind of are to me, but Buffalo Exchange or Cross Roads is a great place to find used trendy clothes! 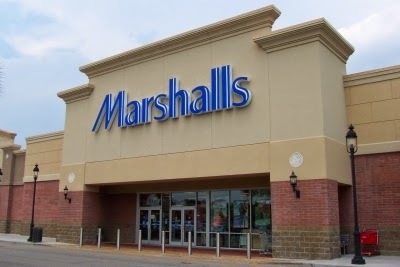 I love going to these stores because I usually find dresses that are more unique items that you may not be able to possibly find in stores. Why? Because they have great flats, and the jeans fit me great! And during the fall, they always have sweaters with fun designs. 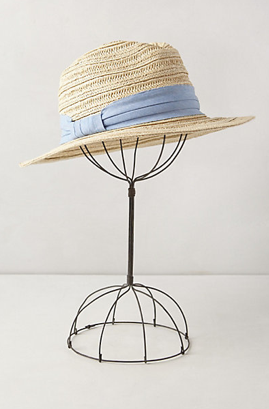 (very j.crew looking but more than half the price) And always check out their clearance section, they sometimes have steals! And right now they are giving an additional 20% your entire purchase! That's my kind of deal! 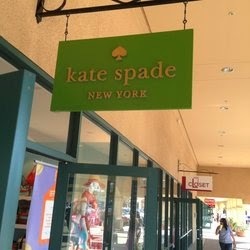 I love Kate Spade, but it costs an arm and a leg! So I usually go to the outlet and wait til they have mega sales, and they give you an additional 15% if you're a student or have AAA! And let me make it clear, I only go here on the rarest of occasion when I am treating myself! They usually have things from past seasons, but I don't care, it's all great and amazing prices for leather bags with great design. And sometimes, if they have a "defected" item that is currently a new arrival at the Kate Spade store, they will sell it at the outlet. I just bought this bracelet at the outlet for $40 when it is currently still $98! It has a small tiny dot on it that is barely noticeable, but if you don't mind, I suggest taking a look at the outlet! This place is one of my favorite places to go. Their shoes and clothes are mostly brand name with a huge discount. I usually go here for dresses, fun tops, and shoes! I recently bought some Jessica Simpson wedged sandals that I love wearing. They are so comfy and got them for $35! These are an item that I wear a whole lot, and goes with all my outfits! These are the kind of things I look for. I love H&M. It's kind of like an older Forever 21. Don't get me wrong, sometimes I find things at Forever 21, but I more times than others find things that are just a little to crazy trendy. 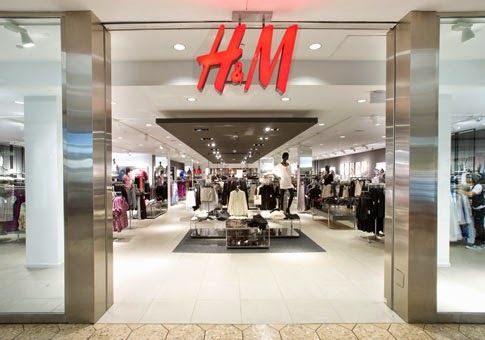 But H&M a lot of times has classic pieces with great structure. I don't go as often but I always find bold pieces. Like tailored coats in amazing colors, or skirts that are just my style! And now you can shop online which is a big deal because before it was only available to the UK. C'mon, everyone has a Target around them! This is one of my favorite places where I simply must resist to buy too many things! Well, they have great shoes, sandals, cardigans, shorts, and more! They always keep changing with seasons so I suggest going often! And sometimes something you saw a few weeks prior will be on clearance, so check those racks too because others are on top it as well! 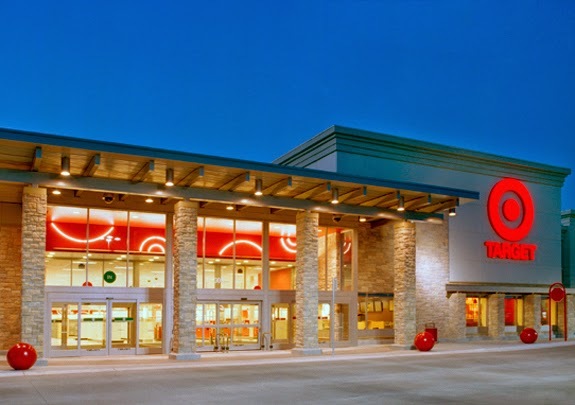 And you can't go wrong when they have big designers selling their specialty line for target. (i suggest waiting for weeks to get those because they go on clearance too) People tend to go the day it comes out, and end up returning a lot so don't fret, you'll get a chance too, and will probably get it discounted! Of course these aren't the only places I go, I shop online, go to other stores in malls and such. But my number one is always make sure you are not breaking the bank! I seriously cannot handle feeling like I spent more on a piece of clothing than a week's worth of groceries. (obviously there are those rare specialty items that you splurge on) But seriously, these stores, and clothes are available to all of you!!! I love pancakes. In any shape or form! Not kidding. Well, the other day I was surfing the web(do people still say that?) looking for dutch pancake recipes. While I was at it, I found a link to a cottage cheese pancake recipe! My first thought was that the pancake was topped with cottage cheese, but when I read the recipe, the pancake is made with cottage cheese! I seriously have never heard of this so I was quick to try. Maybe it's the culinary arts school girl inside of me, but I HAD TO! So I went straight to my kitchen to make because, of course, I already had cottage cheese. I got the recipe from Weelicious. I saw other variations but this one seemed simple and fluffy! When making the pancakes, you can see some cheese lumps in the pancake, but can't even taste it too much. Also, the pancake is so moist, and still cooks like a regular pancake. See, just as good as a regular pancake! Would I make this recipe again? Absolutely! Fluffy, slightly crispy outside, and delicious! And don't forget to top with blueberries/banana, powdered sugar, and syrup! Now you're ready for your weekend breakfast! My April Wishlist consists of a lot of "necessities" and by necessities, I mean things that will be used a whole lot, and things I have been meaning to buy for some time now. And I realize they aren't real life necessities, but let me tell ya, I need all these items in my life! 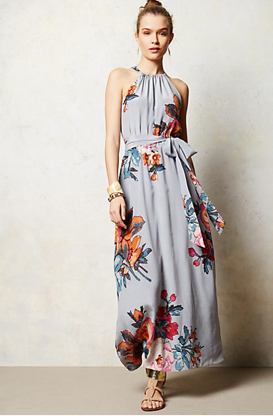 Mid floral skirt / This one of items I have been wanting. 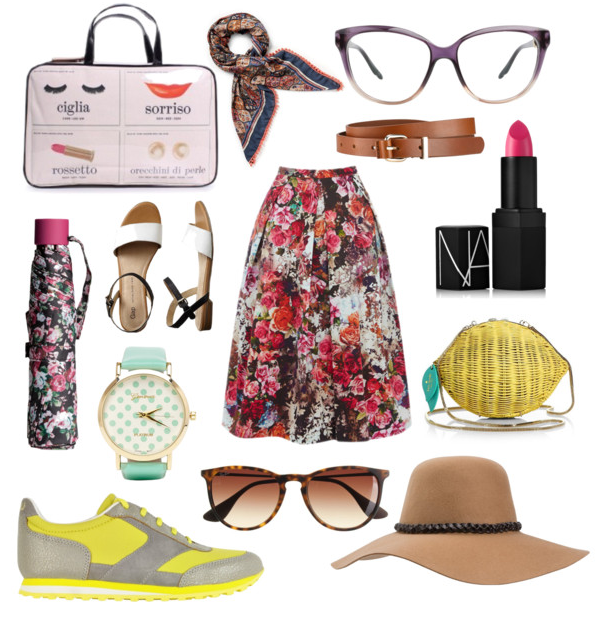 I love midi skirts, but a floral one is a must for spring! running shoes / I need new running shoes and these bright fun ones are perfect! white sandals / This sandals are perfect! Can go with anything, and will probably be used a whole lot! Kate Spade lemon bag / This may not be considered a "necessity" but it is! I saw it at the store and fell in love! mint watch / Everyone needs a good watch! This one is just so fun, and pretty to look at! cat-eye glasses / I am a new eyeglasses wearer. And these are perfect, and stylish! I want! patterned scarf / A printed scarf is something all gals need. For your hair, to tie around your neck, or your purse! tortoise wayfarer / A nice looking wayfarers are great for the spring sunny days! brown hat / We all need a good hat! And a nice floppy brown hippy hat can make a bad hair day better! brown belt / A brown thin belt is a must! I love that it can be used in so many ways, and makes an outfit cooler! floral umbrella / I had a floral umbrella I lost, and must replace with ,of course, another floral! NARS pink lipstick / I love me a good red, but April you can do more pinks! Kate Spade makeup bag/ I am in a deep need of a makeup bag, and this one is so fun! Last week I started a project. And I finally finished it yesterday. I know I did a string art last year, but this time I did a string art without stringing the letters,, and stringing the exterior. 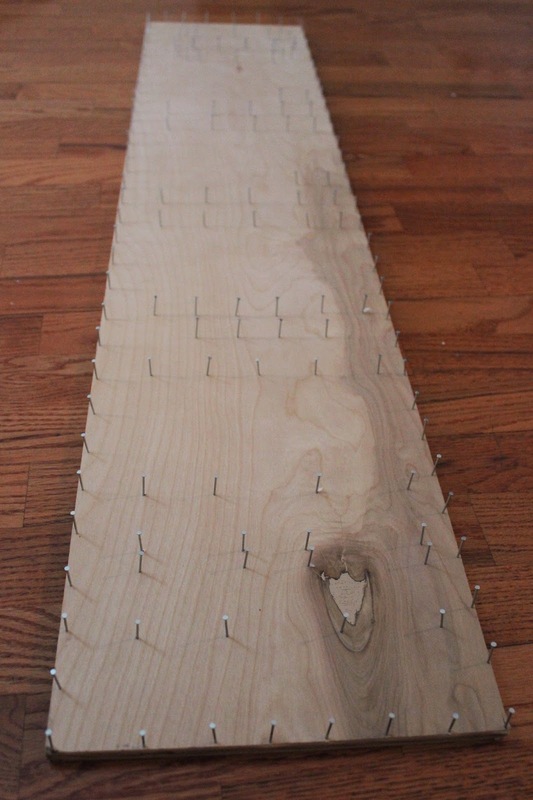 All you need is: plywood, nails, hammer, and embroidery thread! This all started because I have all these random size plywood pieces in my garage, and I found a large one that I thought would be perfect to put some sort of word or phrase. 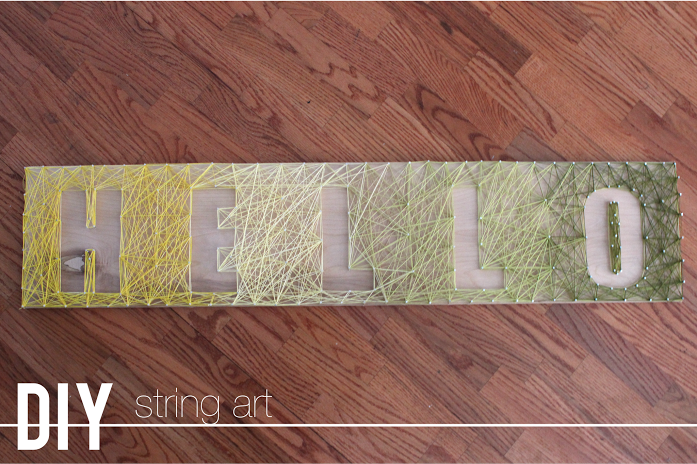 Since I thought the foyer would be a good place for this string art, I felt like the word "hello" seemed appropriate to see when you enter. I went on my computer and tried to figure out which bold font I would like for my "hello". I went with "headline A" because it was simple, but still had some clean styling. 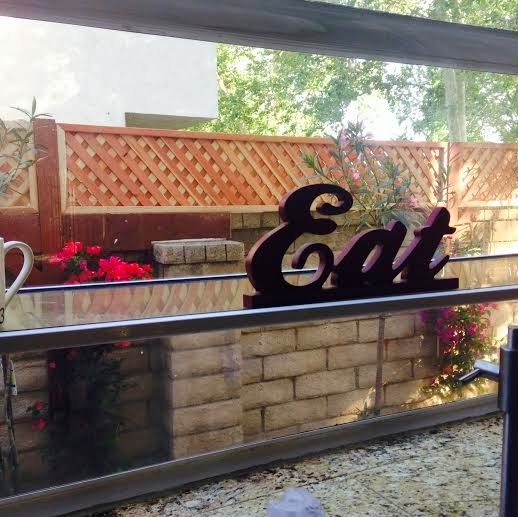 Once you kind of figure out how large you want your letters, print them out and place it on the wood. I luckily didn't have to reprint, but you might have to if you want it larger, or smaller. Once you set your letters out evenly on the wood, you are going to need nails! I used 1" wire nails. And of course, you need a hammer! Then you are going to start hammering nails onto the corners of each letter to make an outline. And yes, you hammer on the actual paper. Once you're done with your letters, you can start hammering along the egde of the plywood. You're basically creating a frame for the piece. P.S since the 'O' has no corners, I just hammered every couple inches. And really close to the corners to still create the curves. And once you're done, you can pull and ripe out each letter. Super easy! Your plywood is going to look a little confusing without the papers so make sure you remember the shape of the letters. Now, you need string! I used embroidery string from Michaels. They have tons of colors. I think I spent about $10 on string. You can go with a solid color, but I wanted to kind of go with an ombre sort of look so I went with a few shades of yellows and greens. When you begin stringing, my suggestion is to first outline your letters. This helps visualize your piece a bit better. Once you're done outlining all your letters, you can start stringing the outside of the letters. I start by knotting one corner and going from random sides to make it look fun crisscrossed. I decided to go from bright yellow, to light yellow, to a lime green, to a dark green. When I got to the next colors, I actually overlapped some areas so it looked more like it was blending to the color. It also helped with the ombre effect. And here's the finished product. 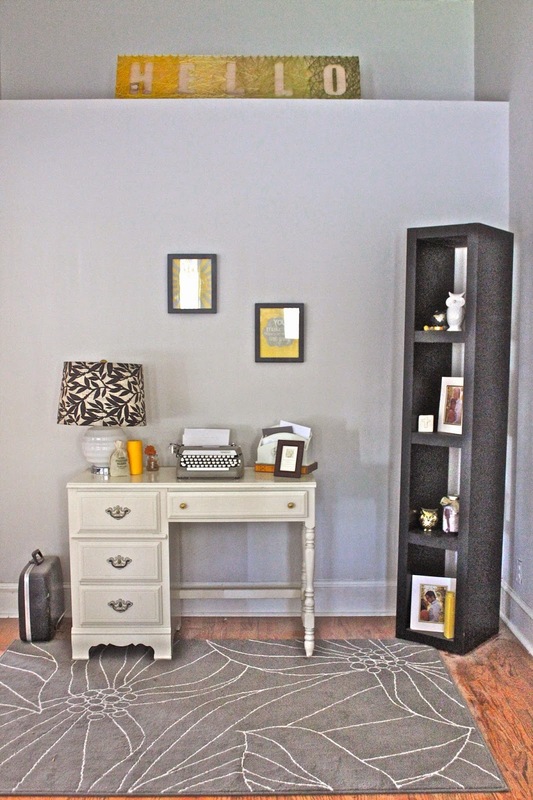 You can leave the wood natural or stain it, but let me tell ya, this project is super easy! And it's less than $20 to do! And here it is sitting in this random nook in the foyer. I love how bright it is! Now the nook isn't empty, and filled with awesome colors, and string! P.S. If you're wondering whether I thought of Lionel Richie while I was stringing...the answer is yes! How could you not?! Had the song stuck in my head for days straight, just got ask my poor husband! And how amazing is this video. Gotta love the '80's! Have a fun time stringing your heart out!